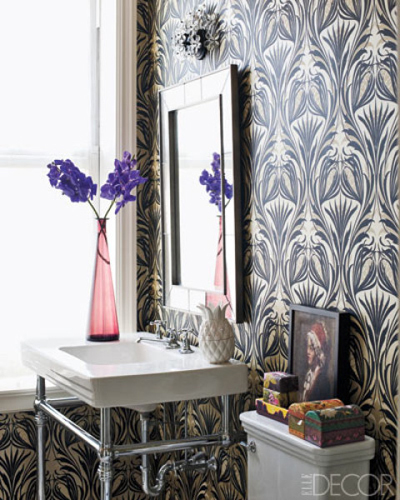 Bathrooms can sometimes be an overlooked room of the house when decorating. 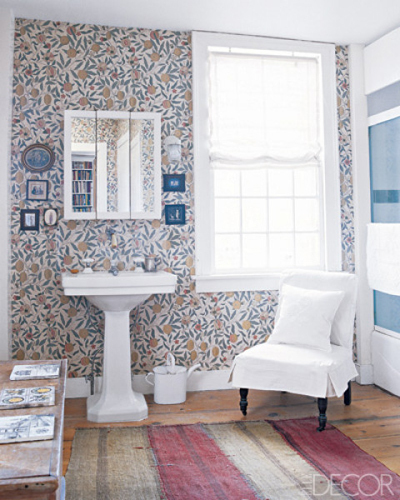 The goal with many other rooms in the house is to make them cozy and comforting...why not look to do the same with your bathroom? Stepping into a well-decorated bathroom is like stepping into your own spa every day, and I don't know anyone who wouldn't want that. Love the wallpaper in these bathrooms! I've always had this crazy dream to have dark walls in bathrooms. I'm talking navy, brown or gray kind of colors. Something about the dark walls, and then using pops of color (or white!) just seems so chic to me. I think navy walls in the bathroom, with white, would be gorgeous! It's one of my favorite combinations. Thanks, me too!! 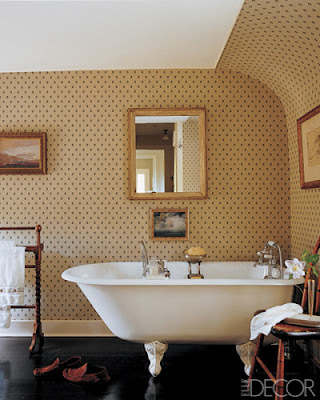 I think polka dots are great for a smaller room like a bathroom.